Mold and yeast work side by side in this game of cheese ripening. Molds metabolize lactic acid and lactate which yields a higher pH that is ideal for proteolytic (proteins) and lipolytic enzymes (lipids) to work on the cheese flavor and texture profile. Interior mold example: Penicillium Roqueforti. This traditional blue mold is still produced within caves using barley and rye loaves as growth substrate. This is the blue strain of mold found in many blue cheeses. A blue cheese develops well if it is stimulated by yeasts, primarily Debaryomyces hansenii . Gas producing Leuconostic , and high fat milk that is non-homogenized and low acidity gives a more crumbly textured, open curd. The oxygen stimulates the yeast development which in turn stimulates the blue mold. Sometimes, Geotrichum Candidum can contaminate the P. Roqueforti development because it enjoys similar conditions. Exterior Mold examples: Penicillium, Mucor, Cladosporium, Geotrichum, Epicoccum, Sporotrichum. 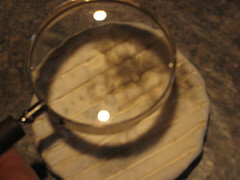 Camembert is a good study of mold development. Initially, there is a proliferation of lactose-fermenting yeasts on the fresh surface. These yeasts include D. hansenii, Kluyveromyceslactis, Saccharomyces cerevisiae. After one week of ripening, P. camemberti is observed. It takes two to three weeks for the P. camembertii to cover the surface of the cheese. The predominant bacteria that develops are B. linens and Hafuia alvei. These molds found are xerophilic species. Xerophiles are extremophilic organisms that can grow and reproduce in conditions with low availability of water. Some examples are Aspergillus penicillioides, A. versicolor, Eurotium spp., Wallemia sebi. These are dominated by salt tolerant yeasts: D. hansenii, Trichosporum inkin, Cryptococcus laurentii, Candida versatilis, Candida apicola, Rhodotorula aurantiaca. Air is found to be the major source of cheese contaminants.